The idea that climate change is an important issue for central banks has gained a lot of momentum recently. In some sense it is surprising that it has taken so long for central banks to enter this heated debate, given the immense risks and disruption that climate change can cause. While the planet is obviously adversely affected, it is only now becoming clearer how climate change can interfere with central banks’ achieving their objectives. While there are many risks this column focuses on transition risks: the risk that an abrupt transition to a lower-carbon economy might precipitate disruption in financial markets. A change in the investment climate for high carbon assets would likely come from two main sources: ethical concerns about investing in firms that contribute to climate change but also, and more relevant to a wider range of investors, expectations of policy change meaning a higher price for carbon may leave certain firms to be unprofitable and their assets essentially “unburnable” and therefore subject to much lower valuations. At the same time the valuations of energy firms which produce more sustainable energy could increase both in relative terms or absolute if policies are announced which subsidise investment in sustainable energy. If this happened suddenly then this could cause large disruptions in asset prices. Over the course of the last year there were some signs that a transition to a low carbon future might be materialising, and quickly. A movement to divest from fossil fuel has turned into a flood. By the end of 2015 more than 500 organisations and 2,000 individuals across the world with US$3.6 trillion in assets pledged to divest from fossil fuel companies, motivated by both moral convictions and profit. Asset managers are a bellwether as banks and insurance firms get in on the act. In May 2015, Bank of America announced plans to reduce its financial exposure to coal companies. Since then, Crédit Agricole, Citibank and Allianz have all made similar announcements regarding their financial exposures to the coal sector. RBS has also followed suit. But it is an open question about what this meant for financial markets. At the Bank we could see that energy firms’ share prices had fallen dramatically but so had the price of oil – their main asset – over the same period. So disentangling the two would be difficult. But there was one way to try and separate out the effect of sentiment shifts and investor concerns about a carbon bubble from the more general ongoing effect of falling oil prices. And that was to use event study methodologies to examine how investors react to climate related news. By examining the change in price of firm’s equity around the time that the news is released and comparing it to a benchmark (in this case the firm’s country’s main stock market index) it is possible to pick up the ‘abnormal return’ – i.e. the return/price change which isn’t just attributable to everything else, as this is picked up by changes in the benchmark. Using a short period around the event this ‘abnormal return’ can be attributed to climate-related news about the firm, and not longer-term things such as oil prices. I found events which may have affected energy firms (by this I include firms all the way down the supply chain so manufacturers and refiners too) by searching in Lexis Nexis for words such as “carbon bubble” “burnable carbon” and “fossil fuels divestment”. Searching for “divestment” is important because regardless of an investor’s own views about a low carbon future other investors selling their stakes should be value-relevant. However, this turned up veritable blizzard of college newspapers, and even though some US colleges have huge endowment funds I decided it was better to restrict the search to major newspapers such as the Wall Street Journal, the Financial Times and also specialist energy periodicals or broker circulars as they would be of interest to investors. An example of an event would be Climate Tracker’s report on unburnable carbon and stranded assets which was later picked up in the Financial Times, or Norway’s sovereign wealth fund’s decision to cut exposure to coal companies. This isn’t a completely conventional event study as usually event studies look at many firms with maybe one or two ‘events’ per firm. In contrast, reflecting the huge interest and importance of climate change, there were over 30 climate related events for firms. And this was after excluding any period where events happened close together. I tested each event individually as well as jointly. This is because I expected some events such as the Paris Agreement – to be more significant and ‘value relevant’. The sample of firms covers the full range of carbon intensity from renewable energy firms to coal firms, so one would expect these firms to react differently. And indeed that’s what I get when I examine the effect of the Paris agreement. 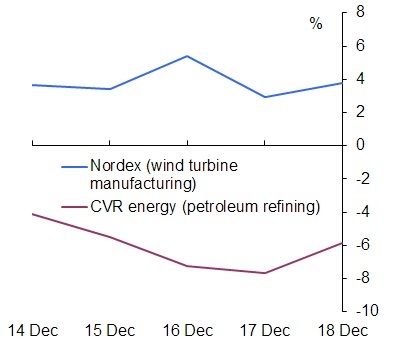 The chart below shows contrasting cumulative abnormal returns experienced by a petroleum refining company (CVR Energy) and a wind turbine manufacturing company (Nordex) in the immediate aftermath of the announcement of the Paris Agreement on 12 December 2015. The reaction was immediate and persistent. Prices jumped immediately on the first trading day, meaning a positive abnormal return of 4% for Nordex and a negative abnormal return of 4% for CVR energy, with gradual declines to end up at a cumulative abnormal return of 6% over the whole period. Both of these were statistically significant. Chart: Cumulative abnormal returns for two companies after the Paris climate change agreement was announced. But this was an unusual case, specific to the Paris agreement and for these undiversified firms. In general, when I look at other events it’s a bit anticlimactic as there’s usually a negative but statistically insignificant effect on the abnormal returns for oil and gas companies, but a positive and insignificant effect for renewable energy companies. There are a number of reasons why this may be the case. The first is that event studies only pick up ‘value relevant’ and ‘unexpected’ events. Some of these events may have been anticipated – indeed some kind of agreement after the Paris conference was inevitable but the three all-night negotiating sessions and the surprise 1.5 degree target suggest that there was considerable uncertainty about the content even then. These events may not be value-relevant. After all the Paris Climate Change agreement is not legally binding and investors may not perceive it, and the carbon budget it implies, as credible. More encouragingly for financial stability is the possibility that none of these events led investors to make huge reassessments in their portfolios – suggesting that the transition to a low carbon future, if it occurs, will happen in a slow and graduated manner, which is consistent with the coefficients showing the expected ‘sign’ but not being large or statistically significant. In addition, investors concerned about holding high-carbon assets may choose to divest from fossil fuels over several years rather than liquidating their portfolios immediately based on specific news. Previous Post Bank Underground is a year old!